getcalc.com's Compound Interest (CI) Calculator is an online finance tool to calculate the interest return on the principal amount lent at certain rate of interest for a particular period of time with either monthly, quarterly, half-yearly or yearly compounding frequency. 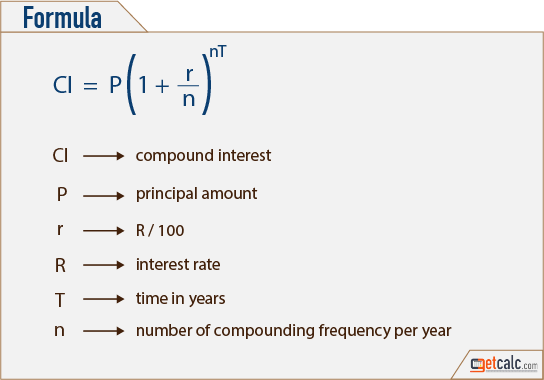 Compound Interest is a finance function or method used in the context of time value of money calculation, often abbreviated as CI, represents the interest on the principal amount on a certain percentage of interest rate for a specific period of time with either monthly or quarterly or half-yearly or yearly compounding frequency, where the principle amount gets changed after every compounding period. In other words, the interest accrued on the principal amount will be added to the last principle amount and the total sum becomes the new principal amount for the next compounding period and so on until the end of tenure.